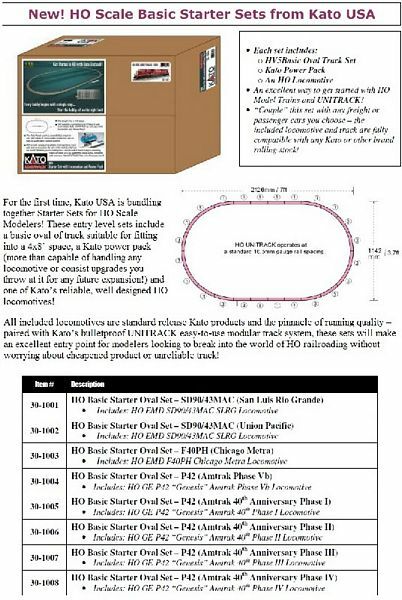 For the first time, Kato USA is bundling together Starter Sets for HO Scale Modelers! These entry level sets include a basic oval of track suitable for fitting into a 4x8 space, a Kato power pack (more than capable of handling any locomotive or consist upgrades you throw at it for any future expansion) and one of Kato’s reliable, well designed HO locomotives. All included locomotives are standard release Kato products and the pinnacle of running quality paired with Kato’s bulletproof UNITRACK easy-to-use modular track system, these sets will make an excellent entry point for modelers looking to break into the world of HO railroading without worrying about cheapened product or unreliable track.